No, the “new addition” isn't a baby, or the gentleman in the photo, it's the desk he's standing next to. The desk has a twin, so we have two “new boys” in the family. I know it probably sounds a little strange to be talking this way about furniture, but these aren't your average desks. Let me explain. 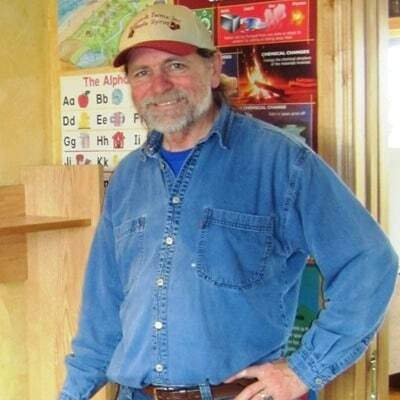 The gentleman in the photo is my friend, Paul Yeager of Cosmic Walker Wood Products. 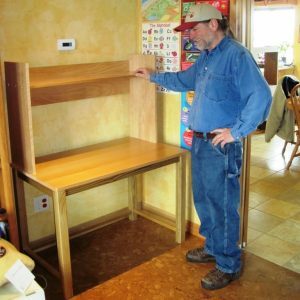 Cosmic Walker Wood Products, LLC provides environmentally friendly solutions to consumers subscribing to sound environmental policies by creating cabinets, built-ins and furniture for homes and small businesses. Paul and I met back in 2004 when my husband and I were looking for environmentally friendly options for the cabinetry in our home. Paul designed all the cabinets and closets in our home utilizing FSC certified lumber, wheat board (“wood” laminate made out of compressed wheat straw) and low/no VOC finishes. The desks the boys had been using were starting to show their age (they had been hand me downs to start), so we gave call a Paul and asked if he could build new desks that would grow with the boys. We didn't specify wood type, just general design. This is what Paul built. The bottom supports of the desk are made from Yellow Pine leftover from a cabinet job. They were sourced from Timeless Timber of Ashland, Wisconsin. There were just a few pieces left, not enough for a large project, but perfect for this application. The timbers were salvaged from a river near Monroe, Louisiana, and were probably cut around 100 years ago. Like Duncan says, “They're a piece of history.” The open box design helps keep the PC well ventilated, increasing cooling efficiency and life of the computer. The desk surface itself is made from FSC (Forest Stewardship Council) certified beech, sourced from Metro Hardwoods of Jackson, Wisconsin. Within this forum, voices from the Global North and South, from organizations big and small, assemble to define environmentally appropriate, socially beneficial and economically viable forest management and identify the tools and resources that will effect positive, lasting change. As a multi-stakeholder organization, FSC applies the directive of its membership to develop forest management and chain of custody standards, deliver trademark assurance and provide accreditation services to a global network of committed businesses, organizations and communities. A term used in the construction industry to describe materials that have no added urea-formaldehyde in the manufacturing process. The term refers specifically to the binders used in composite panel production. Alternative adhesive systems that qualify for the NAUF category would include: Phenol Formaldehyde (PF), Poly vinyl acetate (PVA) and Soy. LEED (Leadership in Energy and Environmental Design) has also adopted the no added urea-formaldehyde terminology under the credit EQ 4.4. The popularity of LEED has driven this term into the mainstream as the public becomes more concerned with issues of indoor air quality. Formaldehyde is a chemical compound with the formula CHOH or CH2O. It is a colorless, pungent gas and common volatile organic compound (VOC). It was first reported by the Russian chemist Aleksandr Butlerov (1828-1886.) Formaldehyde is used as a component in many common products including disinfectants and preservatives, clothing and textiles, plastics and coatings. It is also a by-product of combustion and certain other natural processes. Human beings and plant life actually produce small amounts of formaldehyde on a daily basis! When reacted with urea it produces a hard thermoset resin. These resins are commonly used in permanent adhesives such as those used in hardwood plywood, particleboard and medium density fiberboard (MDF). Urea formaldehyde can “off-gas” for a period of time after the manufacturing process is complete. 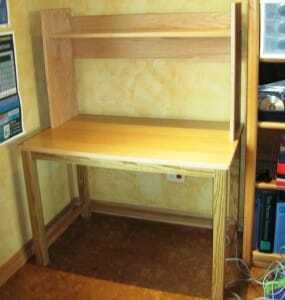 The entire desk is finished with a limited VOC catalyzed lacquer. This product provides maximum durability with minimum outgasing/VOCs in your home. In addition to the woods used, Paul also added adjustable feet to the bottom of the desks, so they can be raised in height as the boys grow. So there you have it – desks that are more than just desks. Call them “eco-desks” if you will. Created out of upcycled, durable and sustainably sourced materials, these desks are made to last a lifetime. Styled to accommodate everything from art projects to duel monitors, they will never go out of fashion. Plus, they match the color scheme in our home office area very well. Good job, Paul! Good job, Paul. Laurie, they are great! Awesome. They are simple and look like they can accommodate many uses. Thanks, Jennifer. I expect they will be with us for many years.